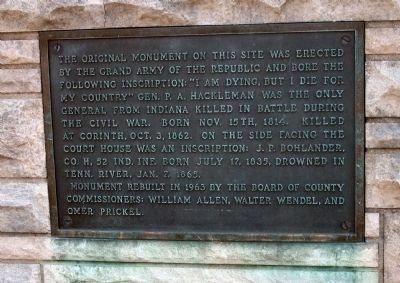 The original monument on this site was erected by the Grand Army of The Republic and bore the following inscription: “I am dying, but I die for my Country” Gen. P. A. Hackleman was the only General from Indiana killed in battle during the Civil War. Born Nov. 15th, 1814. Killed at Corinth, Oct. 3, 1862. On the side facing the Court house was an inscription: J. P. Bohlander, Co. H, 52 Ind. Inf. Born July 17, 1835, drowned in Tenn. River, Jan. 7, 1865. Monument rebuilt in 1963 by the Board of County Commissioners: William Allen, Walter Wendel, and Omer Prickel. Location. 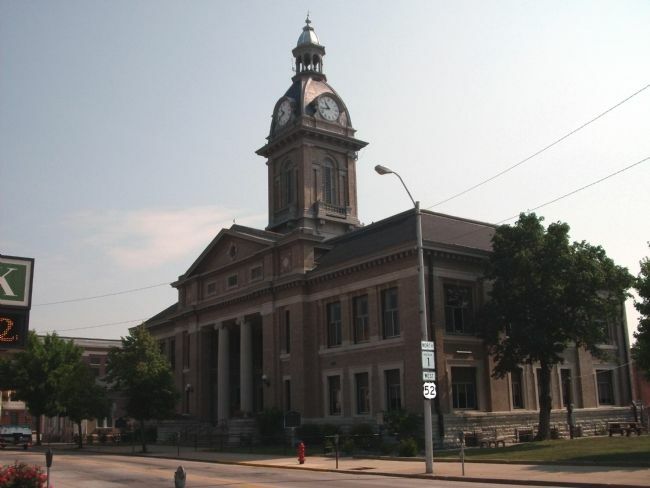 39° 25.118′ N, 85° 0.759′ W. Marker is in Brookville, Indiana, in Franklin County. 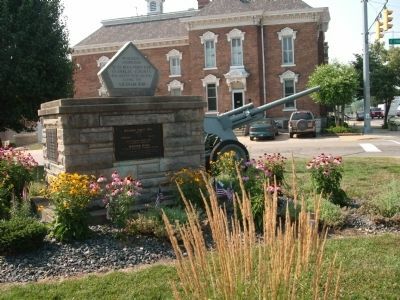 Marker is at the intersection of Main Street (U.S. 52) and East 4th Street, on the right when traveling north on Main Street. Touch for map. 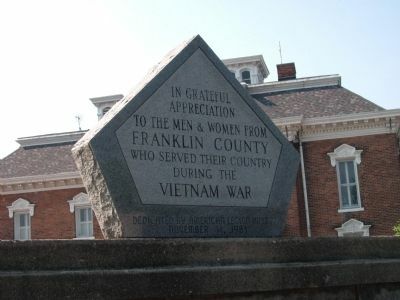 Located on the South/West lawn of the Franklin County Courthouse in Brookville, Indiana. 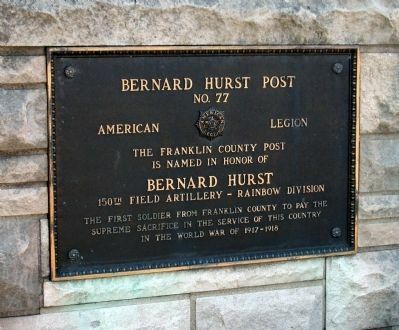 Marker is in this post office area: Brookville IN 47012, United States of America. Touch for directions. a direct line); Goodwin Home (approx. 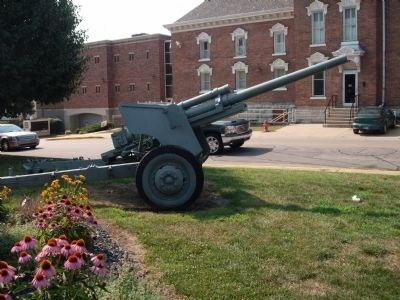 0.3 miles away); Brookville's Carnegie Library (approx. 0.4 miles away); James Brown Ray (approx. half a mile away); Brookville's Grandstand (approx. half a mile away); Brookville College (approx. half a mile away). Touch for a list and map of all markers in Brookville. More. 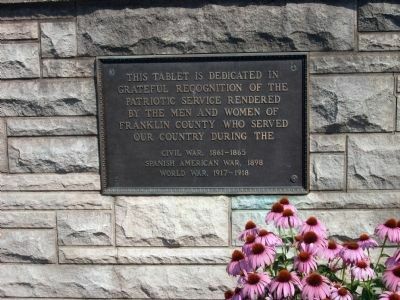 Search the internet for Franklin County War Memorial. Credits. This page was last revised on June 16, 2016. This page originally submitted on July 23, 2011, by Al Wolf of Veedersburg, Indiana. This page has been viewed 1,523 times since then and 8 times this year. Photos: 1, 2, 3, 4, 5, 6, 7, 8. submitted on July 23, 2011, by Al Wolf of Veedersburg, Indiana. • Bill Pfingsten was the editor who published this page.